Two of my earliest memories concern motorcycles. The first one is standing in my uncle’s little scooter, just in front of the seat, while he drove up the rural road where we lived outside of Houston. The second one is being thrown from a motorcycle in a low-side crash. I was probably three or four years years old. Once again, I was riding with my uncle, on his 125cc Montgomery-Wards motorcycle, so it was probably a couple of months later. I was perched on the tank in front of him. It had just rained–torrentially, as it always rains in East Texas in late summer. I don’t remember exactly what happened in the crash. I remember gray, leaden skies in a midday so dark and cloudy it seemed like twilight. For whatever reason, my uncle lost control of the bike leaving my grandparents’ gravel driveway (wet gravel and a 16 year-old rider may be a lot of the explanation for the accident, now that I think of it…). We went right across the road and ended up in the full drainage ditch on the other side. I flew off the motorcycle, body-surfed across the ditch and into the flooded field beyond, and came to a squelching stop in 8 inches of water…and about 6 inches of mud below that. The next thing I remember is my grandmother running out of the house, screaming at the top of her lungs, “You get out of that water before you get polio!” Of course, this was 1968, and I had no idea what what polio was. And, being 1968, neither one of us had on a helmet, of course. Maybe it was those formative years, but I love motorcycles. My only regret about them is that I stayed away from them for so long. 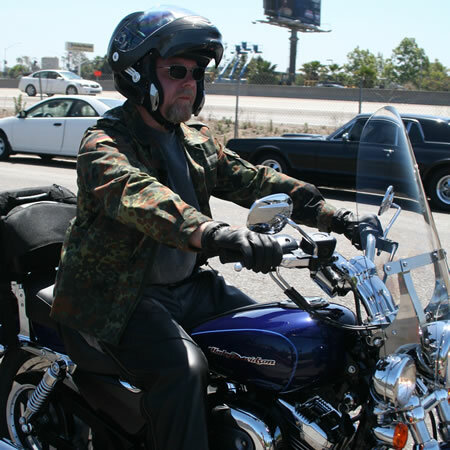 I last rode a motorcycle in 1987, when I was in the Air Force, stationed at Holloman AFB in New Mexico. I got orders to report to the NATO HQ in Brunssum, the Netherlands, and I didn’t start riding again when I got to Europe. Fast forward 20 years, and Iread about this interesting new vehicle from Can-Am (Bombardier), called the Spyder. Gas prices were shooting up, and my Dodge Ram 2500 diesel pickup was becoming a bit uneconomic to drive. All of the sudden, here was this brand new tadpole trike, with a 1 liter Rotax V-Twin, and all sorts of cool electronic stuff. I could ride it, and wouldn’t even need a motorcycle license. Can-Am was, fortunately, offereing everyone and their brother a test ride, so I went to North County House of Motorcycles, borrowed a helmet, and took it for a spin. I got to tool around on the Spyder for over an hour, and I was hooked. But, unfortunately for Can-Am, I got hooked not on the Spyder, but on just going ahead and getting a real motorcycle again. So, in the next two months, I took the MSF course, and bought a Harley-Davidson Sportster, which I thought would be a good bike to begin riding again. 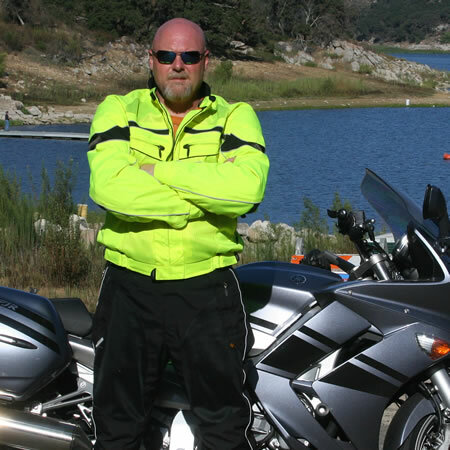 From the day I got it, I became an every day motorcycle rider, putting about 19,000 miles a year on my bike. By contrast, my Ram has about 17,000 miles total on it. Me and the FJR. And REAL riding gear. When I bought the Sporty, I also decided to start blogging about it. I was–and am–part of a moderately successful political weblog elsewhere, and I’ve been blogging regularly since 2002. So, it was only natural that I begin blogging about motorcycling again when I decided to get back into it. The tone of the blog has changed over the last couple of years. I realized that while I loved–and still love–Harley-Davidson motorcycles in the abstract, I didn’t enjoy riding them much. I had more of a need for speed than a man my age should probably have, and ride closer to the edge than a man my age probably should. last year, I picked up a Yamaha FJR1300. It’s still sport-bikey, but it also gives me the cargo capability a gentleman of my ilk requires on a daily basis. So, the blog chronicles my quite unexpected shift away from the cruiser world, and back to the sportbike world of my twenties. I guess I haven’t outgrown my hooligan tendencies. I still drop by the Harley dealerships, though, even if it’s only to look, and talk to the local Harley guys. I have grown up enough, however, to wear full riding gear with CE hard armor at all times. That precaution came in handy when a careless driver ran a stop sign and t-boned me several months ago. I broke a toe, and cracked and banged some other things, but didn’t get a scratch on me, otherwise. I was lucky, but I was also wearing full gear. Over time, the blog has changed emphasis a bit. In addition to being a personal chronicle of my motorcycling experiences, I’ve shifted over to more coverage of the automotive world in general. For instance, I’m reposting all of my automotive writing for Medium.com here as well. So, I cover industry news, manufacturers, motorcycles, cars and just about everything but racing. It’s really started to turn into a general-interest motorcycling and automotive blog, and I think it expands the interest a bit more. So, I hope you enjoy the blog, and feel free to add comments or questions. Dale Franks is the former host of “The Business Day”, a daily, four-hour business and financial news program on KMNY Radio in Los Angeles. From 2002-2004, he was a contributor on military and international affairs for TechCentralStation.com, and from 2004-2006 was publisher and editor of the online politics journal, The New Libertarian. Currently, he is an editor and writer for the popular web log, Q and O, for which he produces a weekly podcast. Dale served as a military police officer in the United States Air Force from 1984 to 1993, in variety of assignments both in the United States and in Europe, including an assignment to the staff of Headquarters of Allied Forces Central Europe. In addition to broadcasting, writing, and speaking on various topics, Dale has also been a long-time technical training instructor on a variety of computer software and technology subjects. 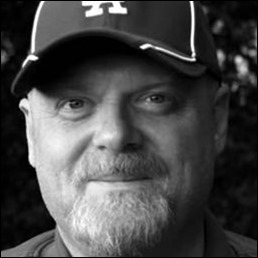 Dale has also long been involved with information technology as an accomplished web designer, programmer, and technologist. Additionally, he is the author of a number of software user guides used for classroom training by one of Southern California’’s premier computer training and consulting firms. Dale has written extensively on politics and economics for a number of outlets. His books, SLACKERNOMICS: Basic Economics for People Who Find Economics Boring, a basic economics primer for the layman, and The Joy of Automotion: Musings From a Vehicular Dilettante, a collection of his automotive and motorcycle writings, are available on Amazon. Dale is a Certified Master of Business Administration (CMBA), which is a professional certification available only to graduates of an accredited Master’s of Business Administration degree program. He is also a Microsoft Certified Professional (MCP). Dale is the Managing Principal of WebmasterDeveloper.Com LLC, an internet technology consultancy in the San Diego area, and writes regularly on automobiles and motorcycles.